Mali (left) is joined by Third Place Winner, Lilah (Right), to show off their check. 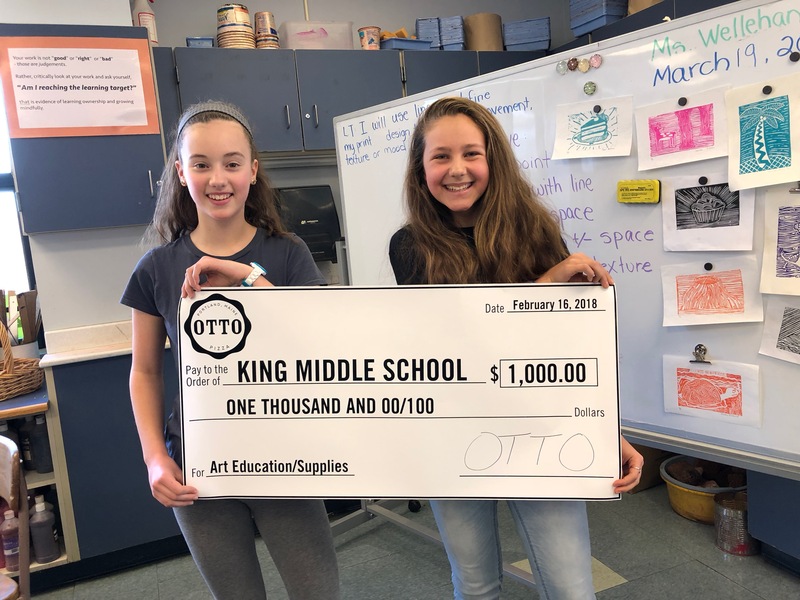 As part of the winners’ prizes for our 2017 ‘Draw Outside of the Box‘ contest, a pizza party was held at King Middle School in our hometown of Portland, Maine. This year, King was home to all three winning designs! The fact that the students were able to celebrate together, with their classmates and teachers, was representative of the collective nature of this project and a testament to the school’s involvement in the contest. Along with the pizza party, all three winners — Mali, Mattea, and Lilah received an OTTO gift card, various prizes from Artist & Craftsman Supply, an OTTO t-shirt, and an OTTO beanie. The first place contestant, Mali, will have her design printed on thousands of pizza boxes and distributed to OTTO locations throughout New England. We anticipate the boxes to be in-store in the coming weeks! 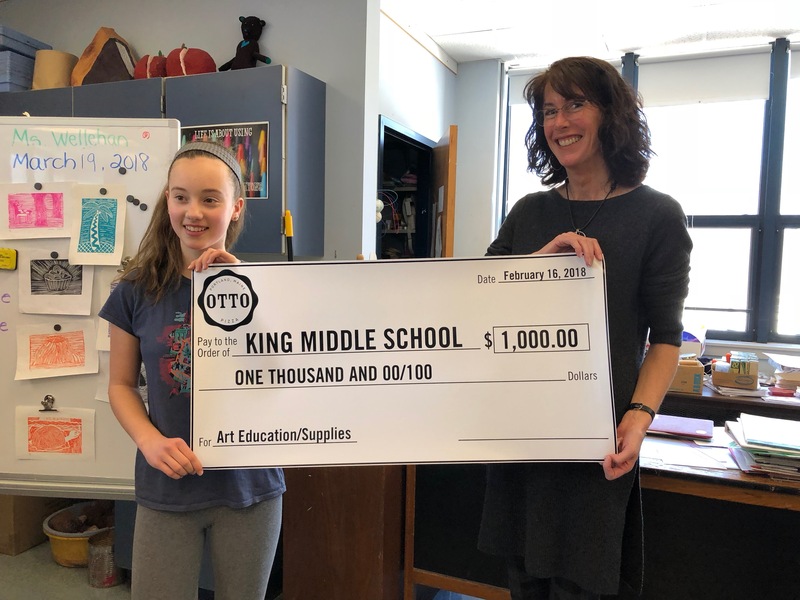 In recognition of Mali’s first-place design and art teacher Mary Wellahan’s dedication to her students, the King Middle School Art Department received a $250 gift card from Artist & Craftsman Supply and a $1000 check in support of art education from OTTO. We decided it was only fitting to give the donation in the form of a giant check because hey, who doesn’t want to get a giant check? The students and teachers were as excited to receive it as we were to present it! 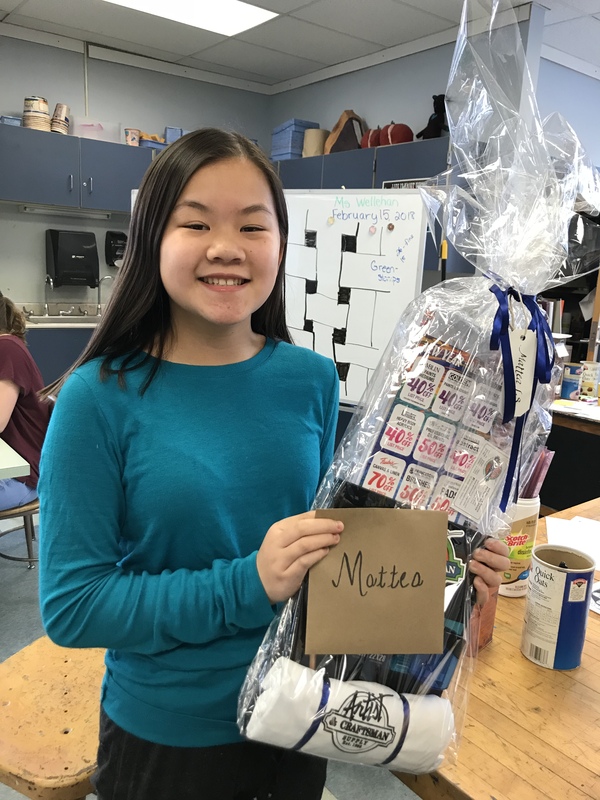 We would like to congratulate all of the talented artists and designers who participated in our second ‘Draw Outside the Box’ contest, as well as thank all teachers, family, and friends that supported so many hard-working and diligent students all across New England! 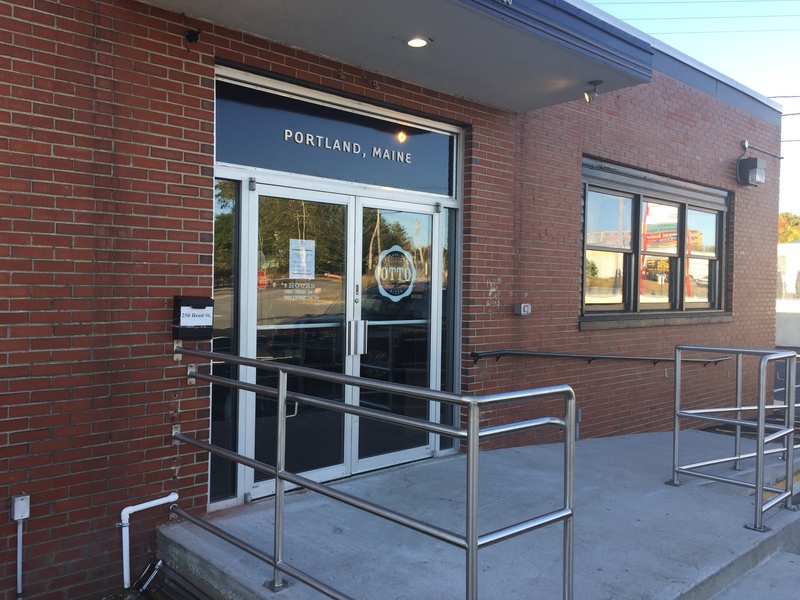 Our Portland Arts District location has re-opened! We are pleased to announce that, after three weeks of closure due to water damage, our original shop at 576 Congress Street will re-open at 5pm on Friday, September 8! We appreciate the outpouring of support we received from the community (and beyond!) while we were recovering from the damage. We are so fortunate to be part of such a vibrant, diverse, and caring community — it reminds us why we do what we do. 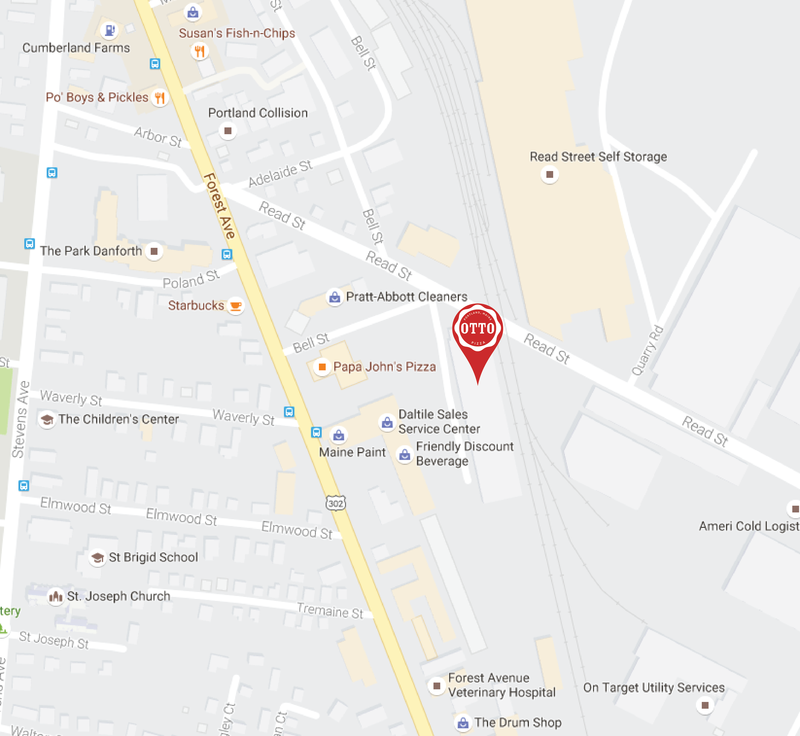 We are so thrilled to be back, and we’d love to see you. Come on down! 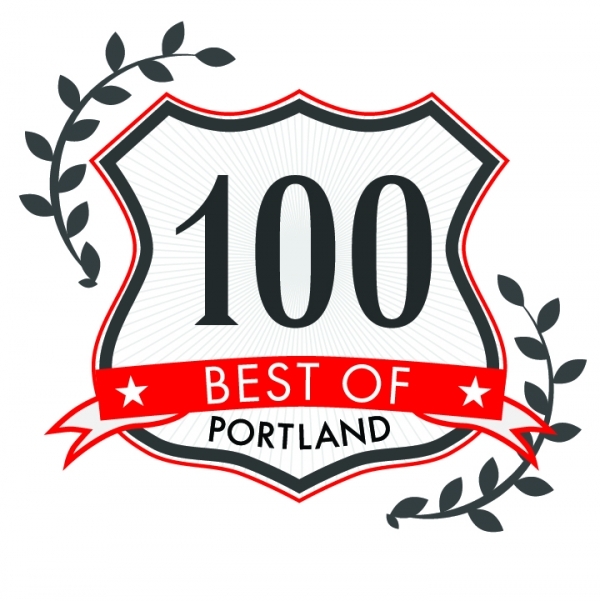 We are beyond thrilled to learn that OTTO has been named Best Pizza and Best Delivery Food in the Portland Phoenix Best of 2017 Awards. 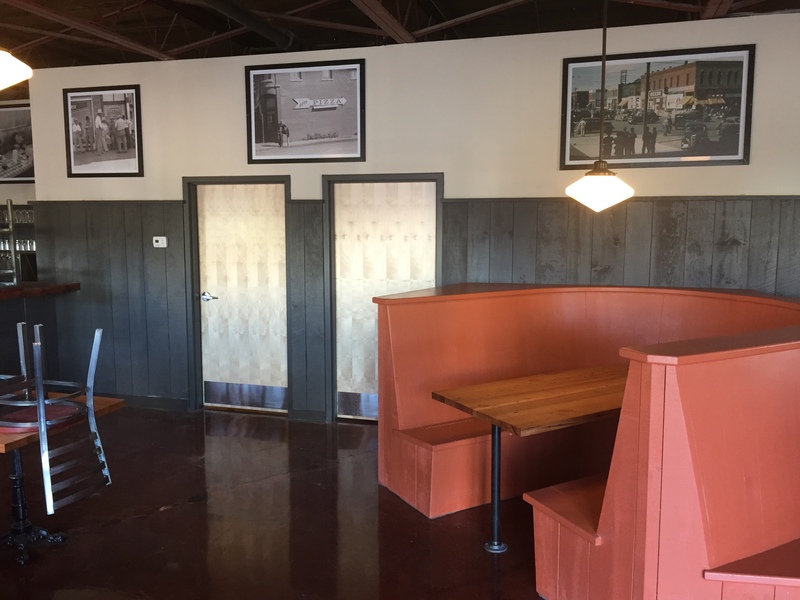 Although it’s been nearly eight years since we opened our first (tiny) slice shop on Congress Street in downtown Portland, it continues to be such an honor to be recognized by those who have made our growth possible. A huge thanks to those who voted for us — not only for your vote, but for your loyalty over the years. 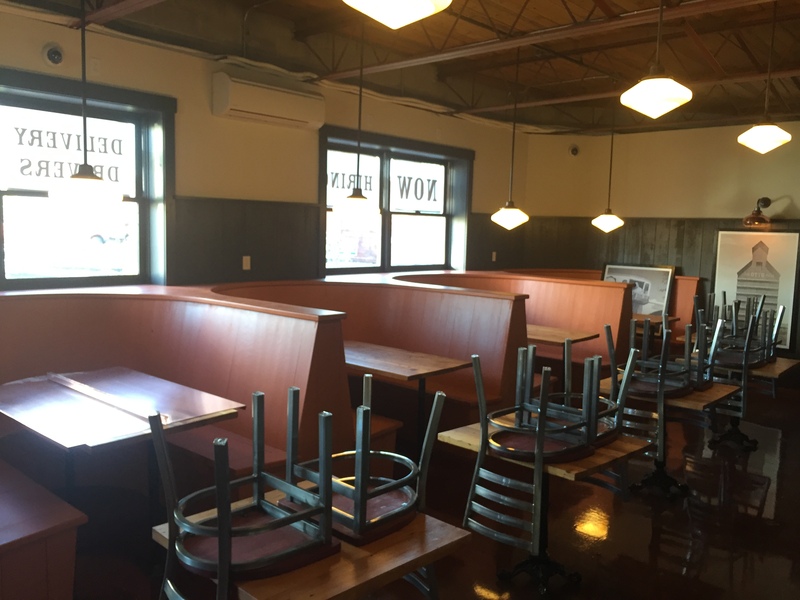 This marks the 18th award OTTO has received via the Phoenix’s annual Best Of poll, including seven consecutive Best Pizza awards, four Best Late-Night Restaurant awards, and four Best Delivery Food awards. 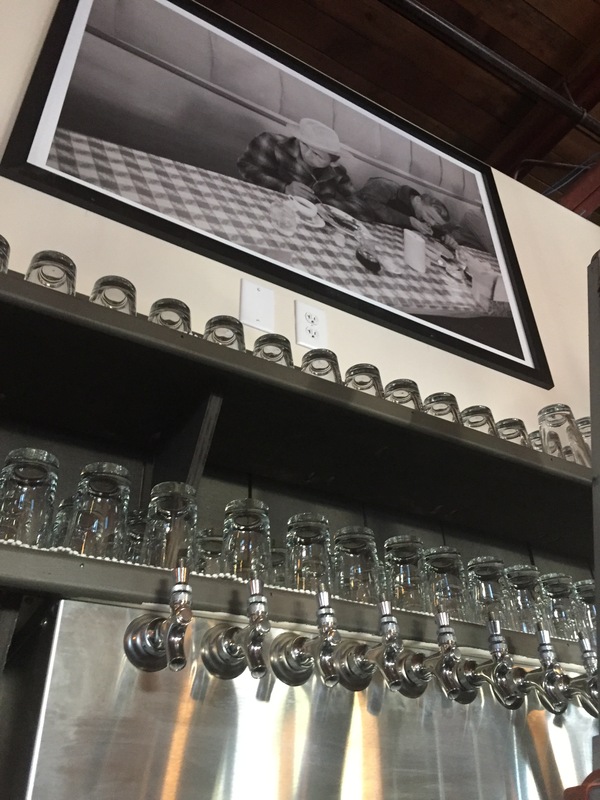 In a town with no shortage of delicious pizza, and with one of the best food scenes in America, we feel especially honored. We look forward to continuing to serve the wonderful folks of Maine. We are so incredibly fortunate to live, work, and make pizza in one of the greatest towns on the planet. 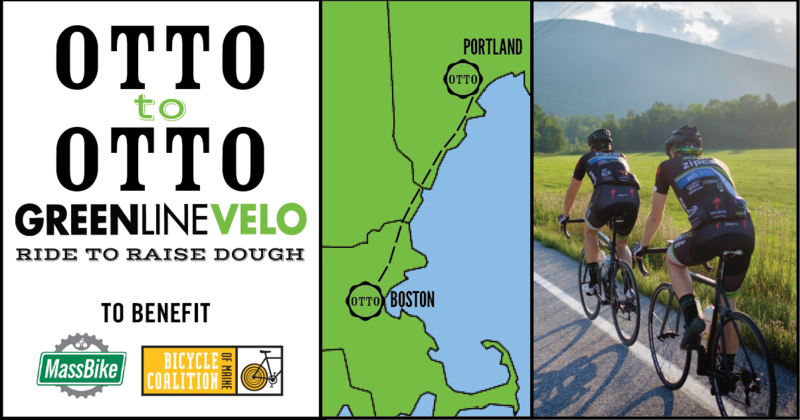 On Saturday, September 24, the OTTO-sponsored bicycle racing team Green Line Velo will cycle from OTTO’s Comm Ave location in Boston to OTTO’s Munjoy Hill location in Portland to raise money, and awareness, for two vital New England bicycle organizations, The Massachusetts Bicycle Coalition and the Bicycle Coalition of Maine. In one day. That’s over 130 miles. They’re gonna need your help, and a lot of pizza, to power through. Green Line Velo and OTTO have been working together for a few years now (OTTO has been the final stop on GLV’s Wednesday Night Group Rides for years). 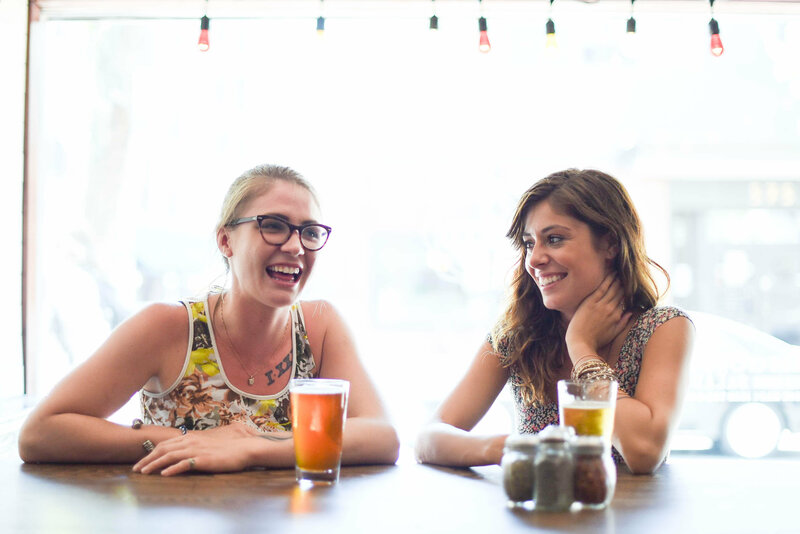 The relationship grew out of proximity, shared values, and, well, pizza, bikes, and beer. 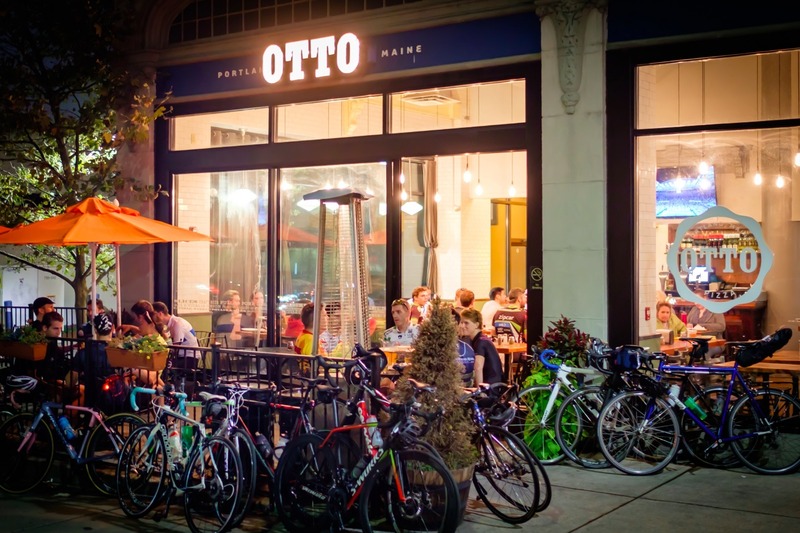 When OTTO became an official sponsor of the team in 2016, the idea of a Boston to Portland ride was sparked. With a shared vision of improving our communities, the decision was made to raise funds and awareness for MassBike and Bicycle Coalition of Maine, with funds going towards cycling safety, infrastructure initiatives, and the promotion of cycling for fitness, fun, and transportation. To kick off the event, we will be holding a fundraiser at our 888 Commonwealth Avenue location in Boston after the final Wednesday Night Group Ride on Wednesday, September 14. 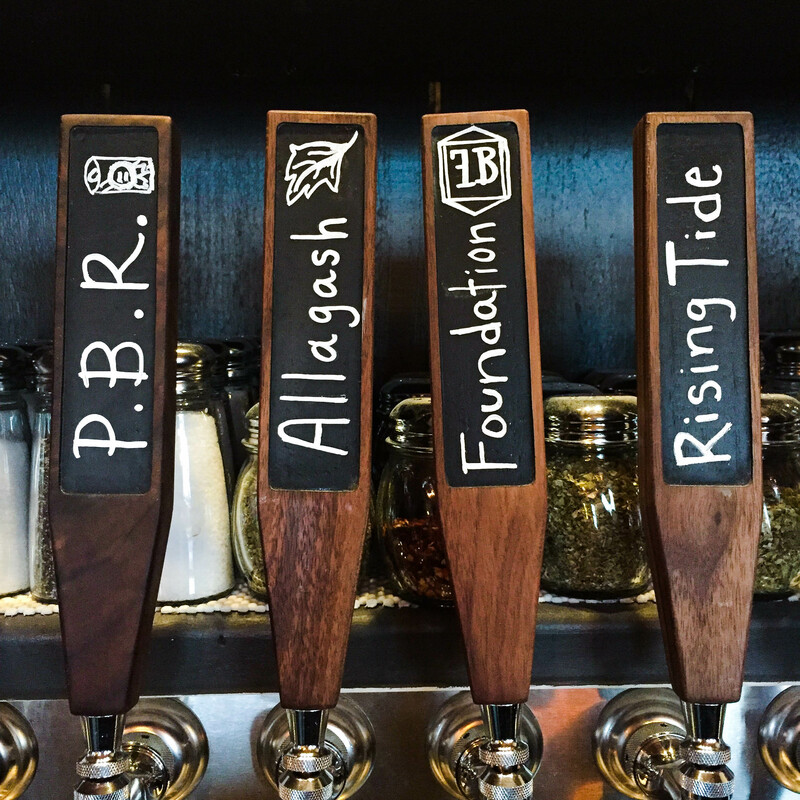 A portion of every sale between between 6pm-10pm will be donated to MassBike and Bicycle Coalition of Maine. Please feel free to come out and celebrate another great season, and wish the team best of luck in their 130-mile journey. Show Some Love — DONATE! Anyone willing to make a donation to support cycling initiatives in Maine and Massachusetts can do so at the ride’s fundraising page. 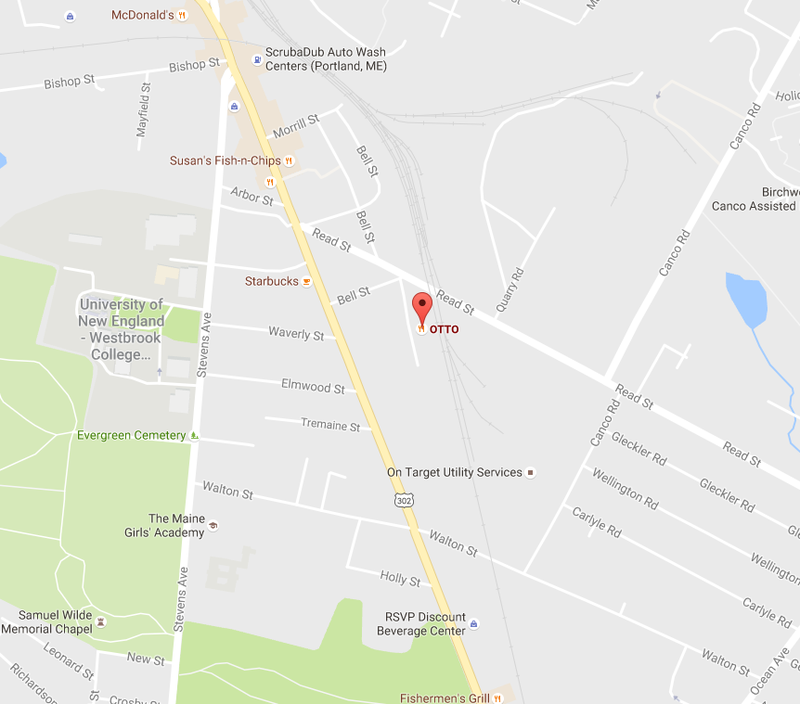 On Saturday, September 24, we will be holding an arrival party at our 225 Congress Street location on Munjoy Hill in Portland from 4-7pm. There will be some great food and drink specials, giveaways, and other goodness. As an added bonus for our cycling enthusiasts, our usual 10% offer to all Bicycle Benefits members will be extended to Buy One – Get One on all slices during the party. You can learn more about how the program works here. If you haven’t already signed up, the time is now! 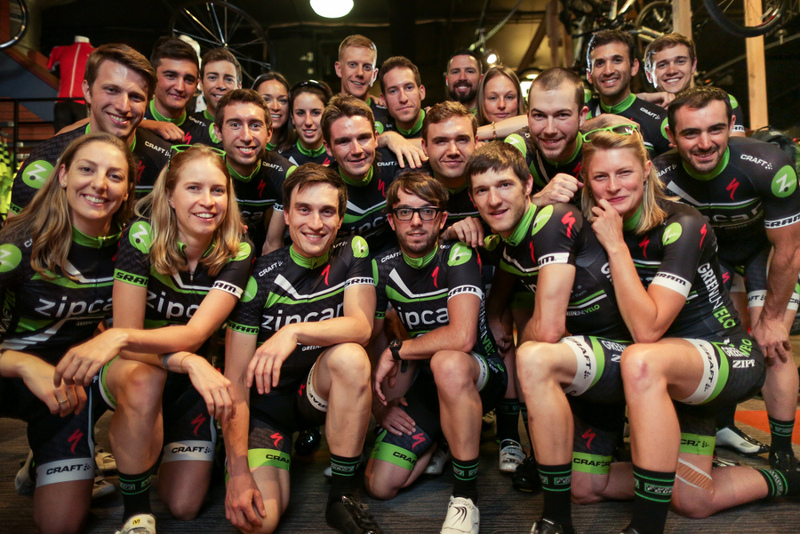 Come out, meet the team, and support the cycling community! Green Line Velo is a bicycle racing team based in Boston dedicated to competing at a high level and developing both individual riders and the sport in general. By focusing first on a high level of camaraderie, they strive to create a team experience that is similar to collegiate cycling and which creates a cohesive group both on the road in races, as well as on training rides. GLV are dedicated to the love of the bike, the spirit of competition and, more importantly, to the pursuit of fun and enjoyment for all. They believe that the bicycle provides the means for their members to enact social good. Through a combination of competition and community outreach, they seek to promote that social good both on and off the bike. The Bicycle Coalition of Maine works to make Maine a better place to bicycle. Founded by a small group of cyclists in 1992, the Bicycle Coalition has grown into one of the most effective bike advocacy groups in the country. The Massachusetts Bicycle Coalition (MassBike) promotes a bicycle-friendly environment and encourages bicycling for fun, fitness and transportation. 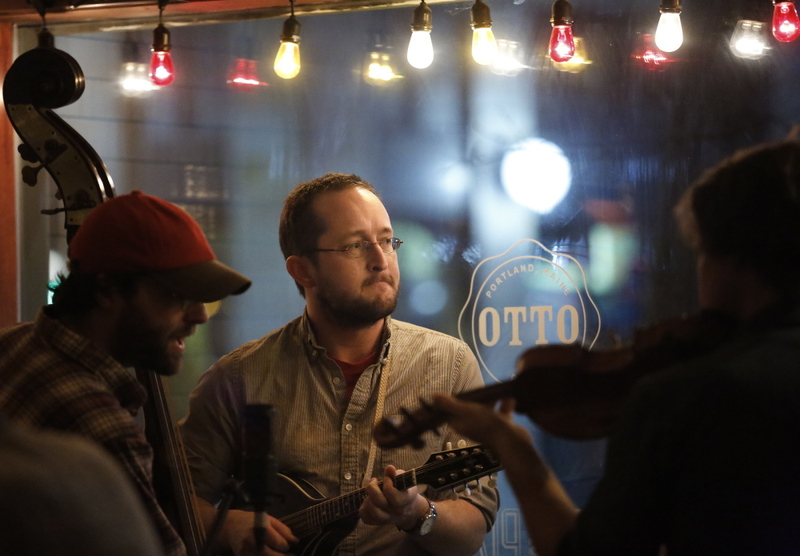 Three years ago, the acclaimed bluegrass player Joe K Walsh started a Monday night tradition in Portland’s Arts District: Bluegrass Night at OTTO. 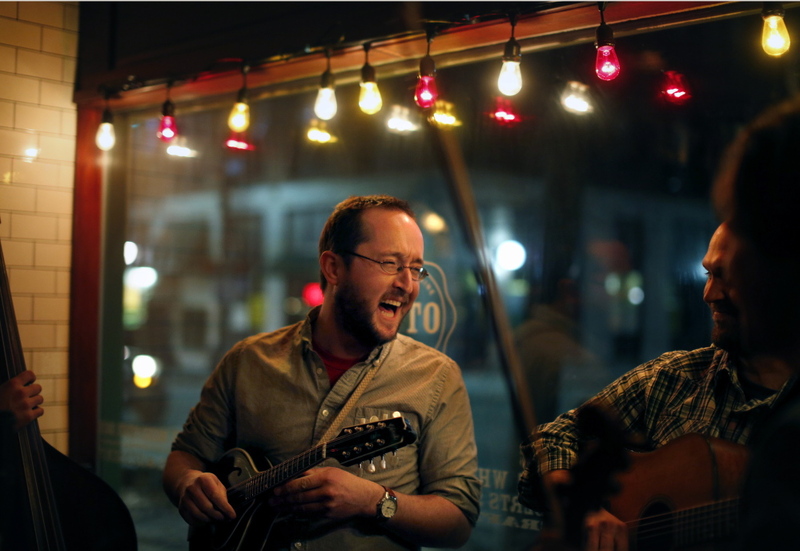 Joe and Friends have been a staple at the 576 Congress Street location, laying down some of the best performances (of any genre) you will find anywhere in Maine. We’re pleased to announce that, after a short winter hiatus (while Joe was on tour with Mr. Sun, his band with Darol Anger, Grant Gordy, and Ethan Jodziewicz), Bluegrass Night is back, starting Monday, March 28. The first edition of 2016 will feature Joe, along with Steve Roy, Lincoln Meyers, and Lukas Pool. For the uninitiated, Joe Walsh was the first student at Berklee College of Music to graduate with a degree in performance specializing in mandolin. He currently teaches at Berklee, where he serves as Managing Director of the American Roots Music Program. Joe has played in several renowned bands, including Joy Kills Sorrow, the New England Bluegrass Band, Northern Lights, and the Grammy nominated Gibson Brothers. And he loves it so much, each Monday night he assembles a handful of the best roots musicians in Maine, or in America, for a fireworks-display of fretwork, lonesome harmonies, and good times. Some of Bluegrass Night’s past guests have included members of Crooked Still, Della Mae, the Josh Ritter Band, and the Ray LaMontagne band. You never know who might pop up, but you can always expect to be blown away. And to boot, the shows are 100% free. So, grab your family and friends, pop over for a few pies, some local craft beer, and take in some of the very best bluegrass you’re likely to hear anywhere. 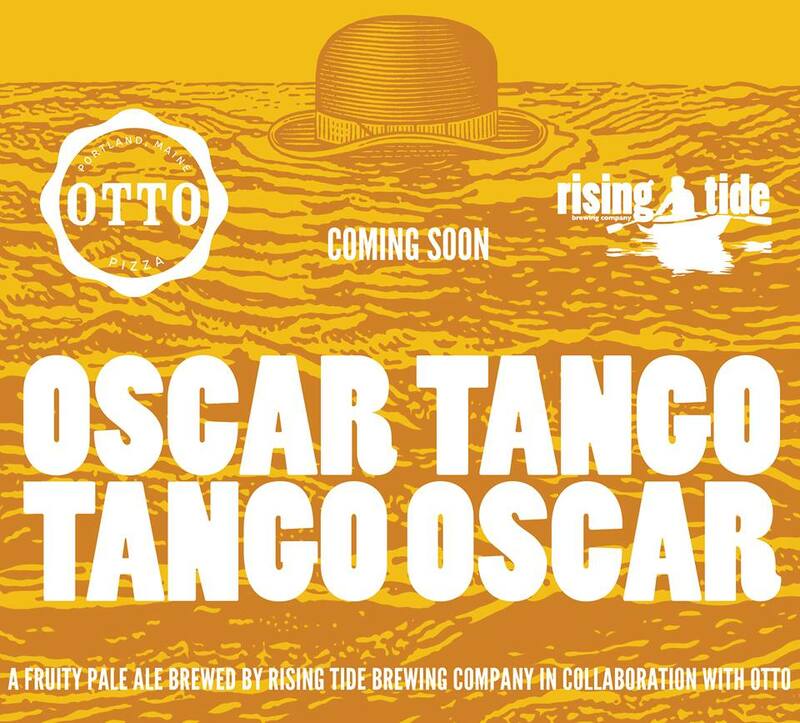 Please join us on Wednesday, March 30th as we launch OTTO and Rising Tide Brewing Company‘s spring collaboration, Oscar Tango Tango Oscar — a crisp, snappy, and sessionable pale ale brewed with rice. 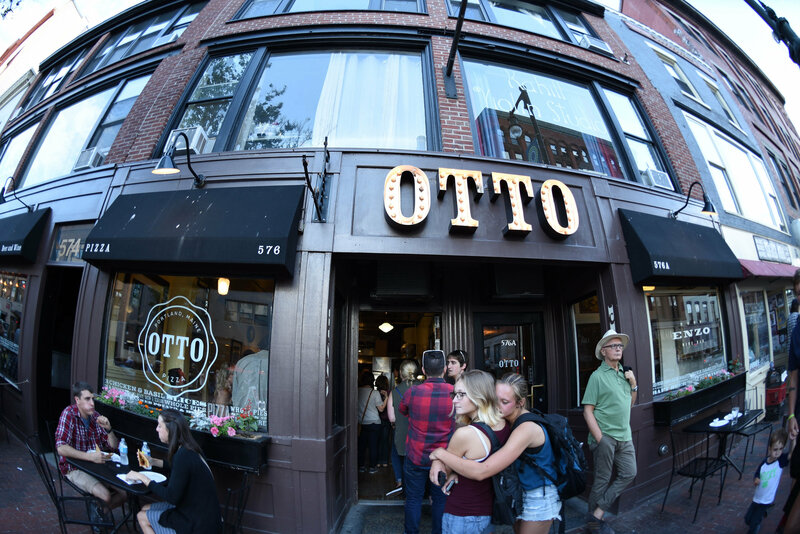 The celebration will be happening simultaneously in Portland and Massachusetts, with launch parties at two OTTO locations on Wednesday, March 30. 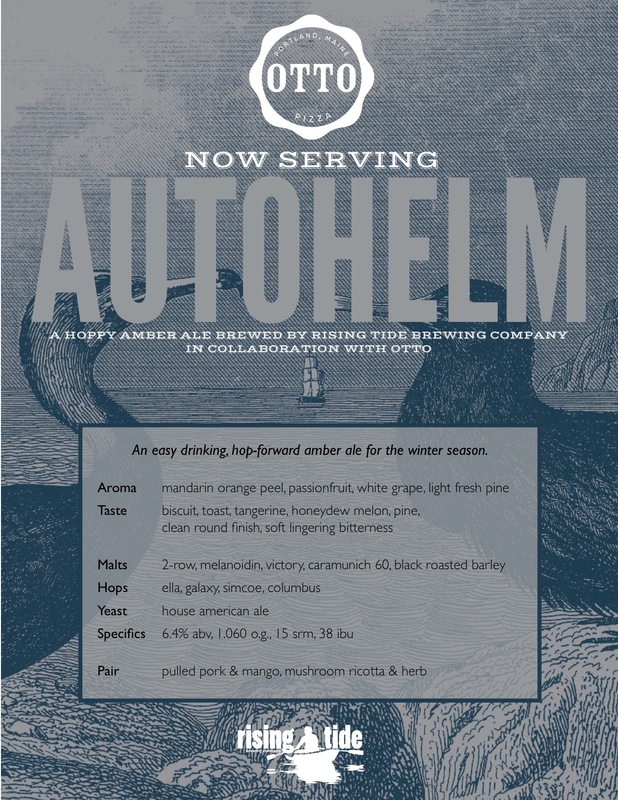 Join OTTO and Rising Tide team members at 225 Congress Street in Portland’s Munjoy Hill neighborhood or 289 Harvard Street in Brookline’s Coolidge Corner from 6-8pm, as we start pouring this delicious brew. 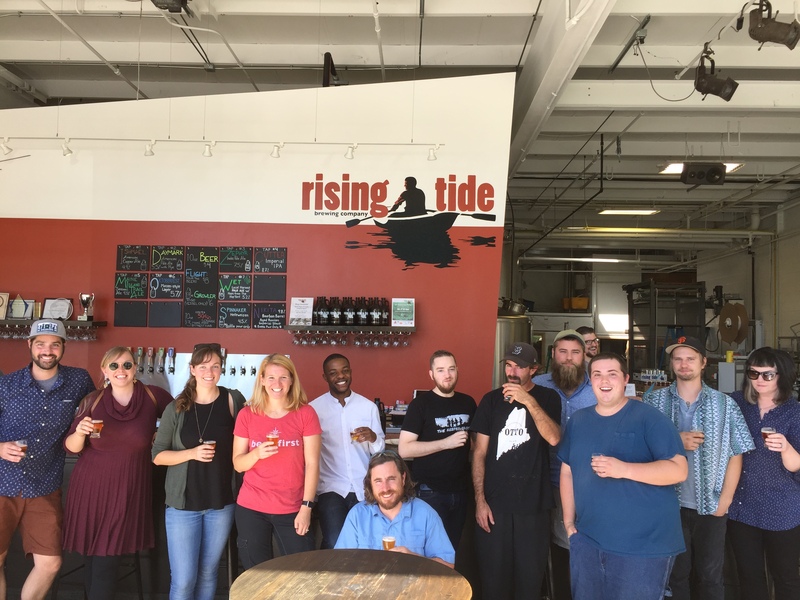 Lucky attendees will receive Rising Tide and OTTO schwag! 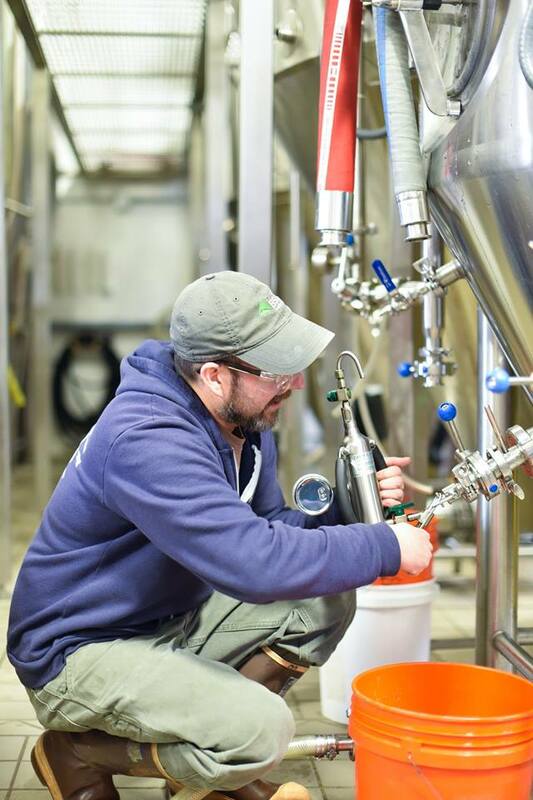 The brewing process kicked off on February 23rd, with OTTO team members on site. 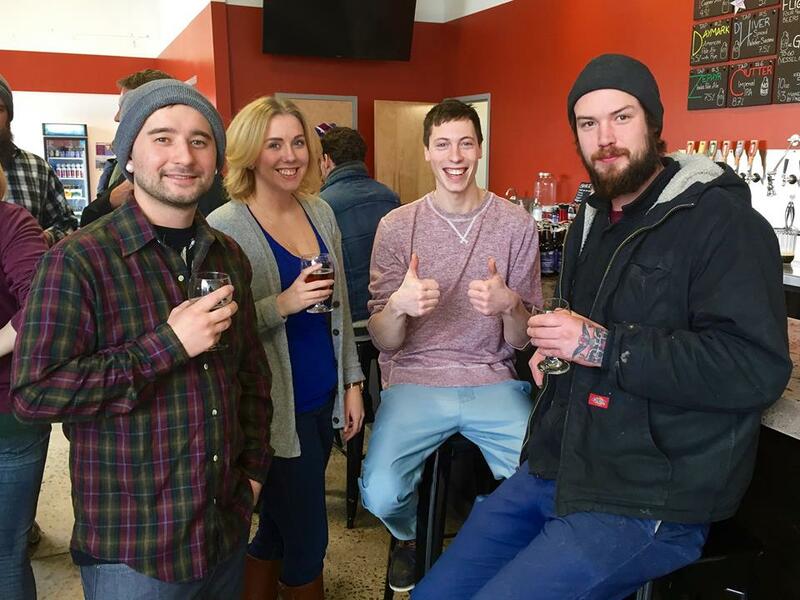 This is the second year of this annual spring collaboration, which currently holds a respectable 3.71 rating (with 218 check-ins) on the popular social drinking service Untappd. Oscar Tango Tango Oscar’s citrusy snap goes perfect on our sunny patios while sharing one of OTTO’s spring pies — eggplant, ricotta and basil, or roasted chicken, caramelized pears and fontina. Oscar Tango Tango Oscar’s profile is sure to provoke an onset of Spring Fever. Proceed with caution. Over the past thirty years, thousands of restaurant owners, managers, manufacturers, distributors, food brokers, and service providers have been convening every March for this industry event — the largest pizza show in the world. In addition to the International Pizza Challenge (bake-offs before judges in five divisions, with Pizza Maker of the Year finals) and the World Pizza Games (skills competition in five divisions), the four-day convention also features approximately 90 keynote addresses, seminars, workshops, panel discussions and demonstrations. 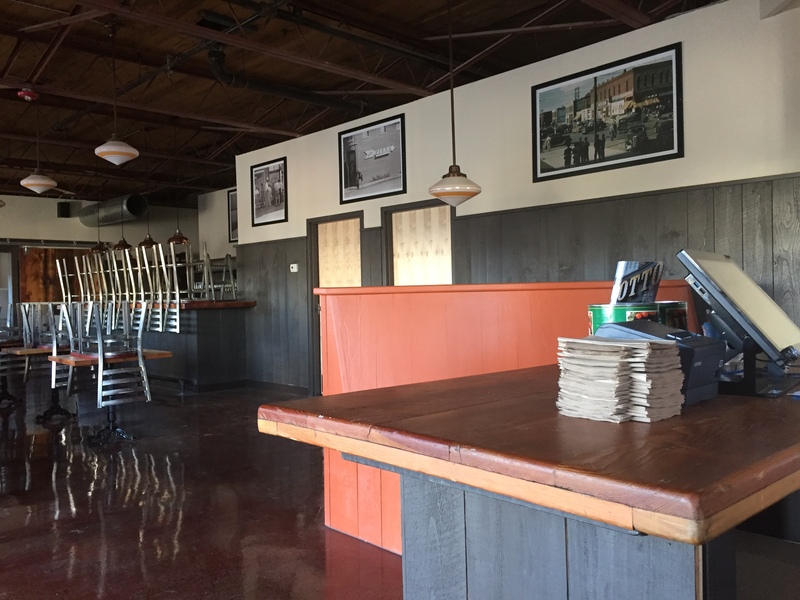 OTTO co-owners Anthony Allen and Mike Keon will be making two appearances. 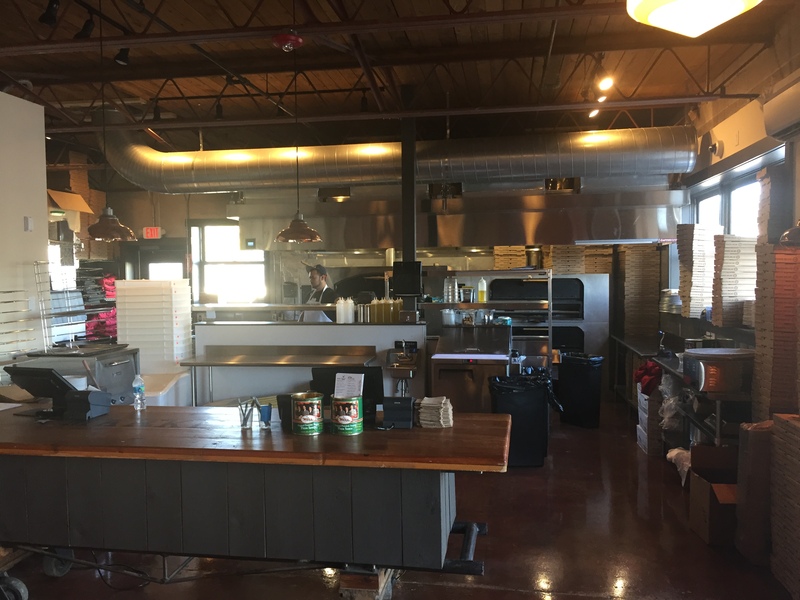 On Tuesday, March 8, Mike and Anthony will be performing a live baking demo, ‘Pizza Outside the Box,’ where they will discuss OTTO’s penchant for non-traditional ingredient combinations. 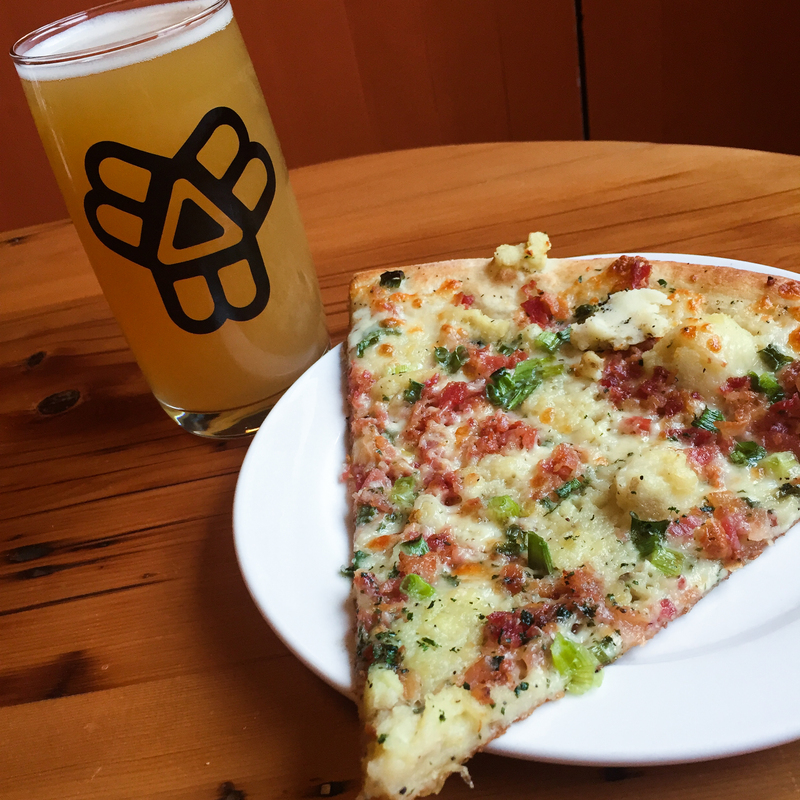 Attendees will get to watch step-by-step baking demonstrations of two of the pizzeria’s signature pies: The Mashed Potato, Bacon & Scallion pizza, and the Butternut Squash, Cranberry & Ricotta. 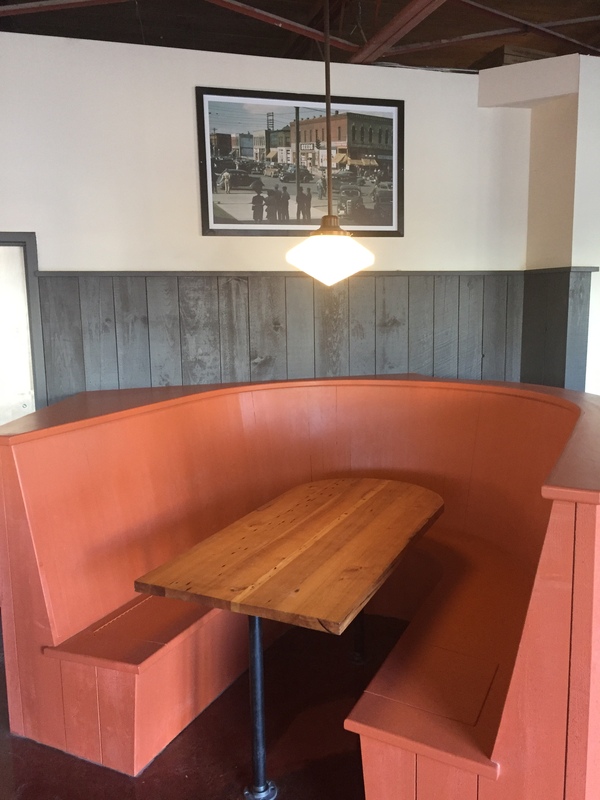 On Wednesday March 9, Mike and Anthony will present a seminar, ‘Creating a Unique Dining Experience in Nontraditional Settings,’ in which they will discuss OTTO’s unique dining environments — from a location in a former gas station to booths built out of scrapped pianos. Eric Shepherd, OTTO’s Director of Marketing and Communications will be making two appearances at this year’s Pizza Expo. On Monday, March 7, as part of the School of Pizzeria Management, Eric will be co-conducting a 4-hour workshop entitled ‘A Coordinated Marketing Plan for Pizzerias,’ in which he will share knowledge, tools and techniques to raise brand awareness, expand customer bases, and increase repeat business. On Wednesday, March 9, Eric will lead a seminar entitled ‘Grow Your Customer Base With Cause Marketing’ in which he will discuss OTTO’s dedication to the communities in which it does business, through multiple weekly fundraisers in two states, and year-round support of local and regional charities, organizations, and schools. 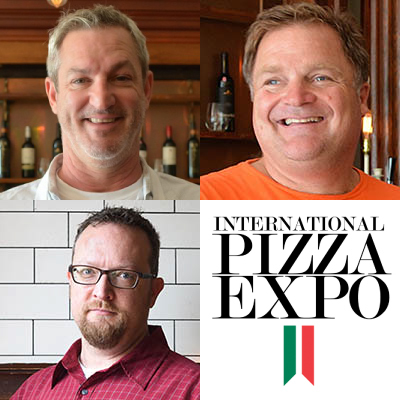 This will be Mike and Anthony’s second year presenting at Pizza Expo, and Eric’s third time around. If you happen to be in Vegas, come by and say hello. Other OTTO team members will also be on hand. We look forward to seeing you, and we hope to come back smarter, and inspired.